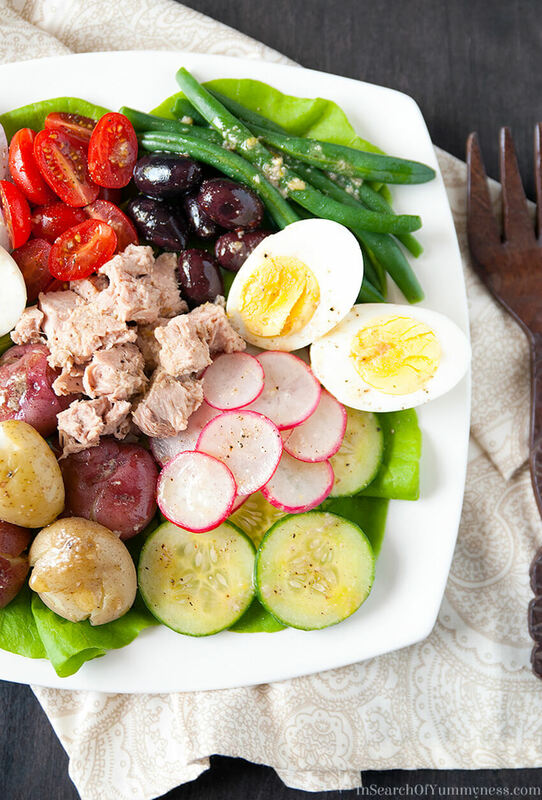 My salade niçoise recipe is made with creamy new potatoes, tender-crisp green beans, juicy tomatoes and more! This Salade Niçoise recipe post is my personal protest against every store that currently has shelves lined with Halloween merchandise. It’s the middle of August, and no one wants to think about back-to-school, much less Halloween. Why can’t we just enjoy the seasons as they come and go? Right now all I want to do is make the most of the remaining warm weeks of summer, and enjoy the produce that comes with it. I noticed tiny baskets of fresh new potatoes at the grocery the other day, and decided to scoop some up for this salad. 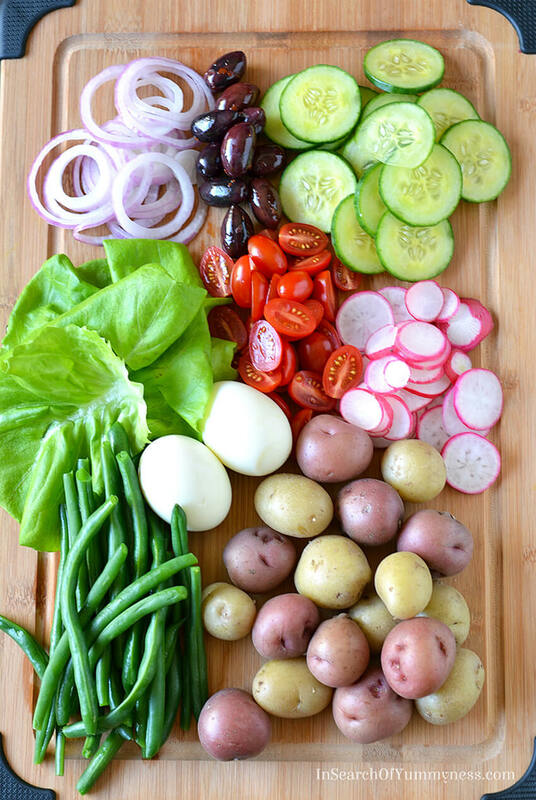 Which is funny, when you consider that boiled potatoes are not in traditional Salade Niçoise recipes. Apparently, you’re not supposed to use boiled vegetables at all, according to this blog post by David Lebovitz. I like making this salad with potatoes though. In fact, it’s my favourite part of the dish! I love how the dressing soaks into them, and the soft creamy texture is a nice contrast to all of those crisp veggies. It also makes the salad more filling, which is great if I’m going to be eating it as a main dish. So while my salad is far from traditional, I can assure you that it’s delicious. It does include tomatoes, black olives, garlic and anchovies, which are all integral ingredients in cuisine from the Nice, France area. Oh wait… no, I lied. I think I used Kalamata olives… and those are Greek. Well, if you want the real deal you should check out David’s post that I linked to. Otherwise, stick with me and I’ll walk you through my tasty, non-traditional, Salade Niçoise recipe. I used red and white new potatoes, but of course you could use either kind exclusively. You can add any seasonal vegetables to this recipe, but I recommend the following: tiny cherry or grape tomatoes, your favourite briny olives, crisp green beans and radishes, and fresh slices of cucumber for good measure. The eggs add protein and richness to the dish, just be sure not to overcook them. These are hard-boiled, but you could even go with a slightly softer yolk for a bit more lusciousness. For the tuna, I recommend looking for tuna packed in olive oil. It is so much nicer than tuna packed in water – at least for this kind of preparation. It makes horrible tuna sandwiches… but that’s a story for another time. 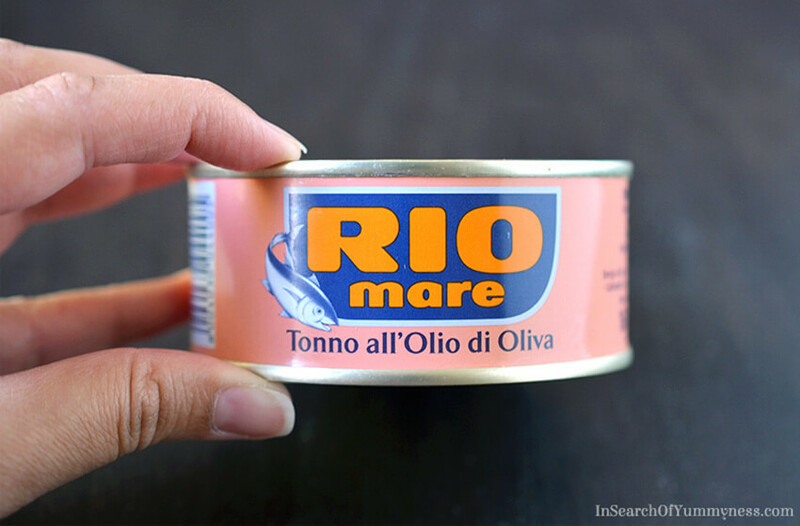 Rio Mare is the only brand of oil-packed tuna that I could find at my local grocery store. I’m showing you the can in case you want to go look for it (they did not sponsor this blog post). Otherwise the only other thing to note in this recipe are the anchovies. I put them in the dressing, instead of whole in the salad, so you don’t have to worry about getting a salty, fishy bite. They are pretty integral to the flavour of the dressing though, so try not to leave them out. I promise that although they might look at bit scary, once they’re blended into the dressing you’ll hardly know they’re there! 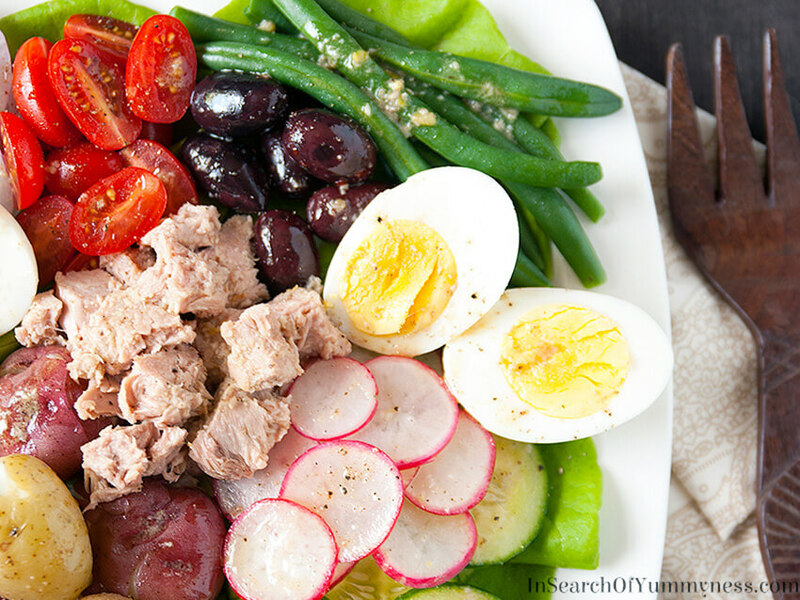 I hope you like this Salade Niçoise recipe as much as I do. It’s been in constant rotation at my house along with this couscous salad and with spinach salad with pears. An interpretation of the classic French composed salad. This one has tuna, potatoes, olives, green beans and more. Instead of adding anchovies to the salad, I've blended them into the dressing! Add all ingredients to a food processor and blend until emulsified. Adjust seasoning to taste, then set aside. Alternatively, you can add the ingredients to a bowl and whisk until smooth. Rinse and dry all vegetables before you start cooking. Place baby potatoes in a pot of cold, salted water and bring to a boil. Cook 15-20 minutes or until fork tender. Drain, then set aside to cool. Place eggs in a single layer in a large pot. Fill with enough water to cover. Bring to a rolling boil, then remove pot from heat. Let eggs stand in the hot water for 10-12 minutes, then drain and rinse with cold water to stop the cooking process. Peel eggs, cut each one in half, and set aside. Placed green beans in a pot of water, and cook until just barely tender (about 3 minutes). Plunge the cooked beans into a bowl of ice water to maintain the bright green colour. Drain and set aside. Use a potato masher, or a fork, to press down on the cooled potatoes until they crack. You don't want to completely smash them, just break them enough so they can absorb the dressing. Arranged the lettuce in a single layer on a large platter. This is the base of your salad. 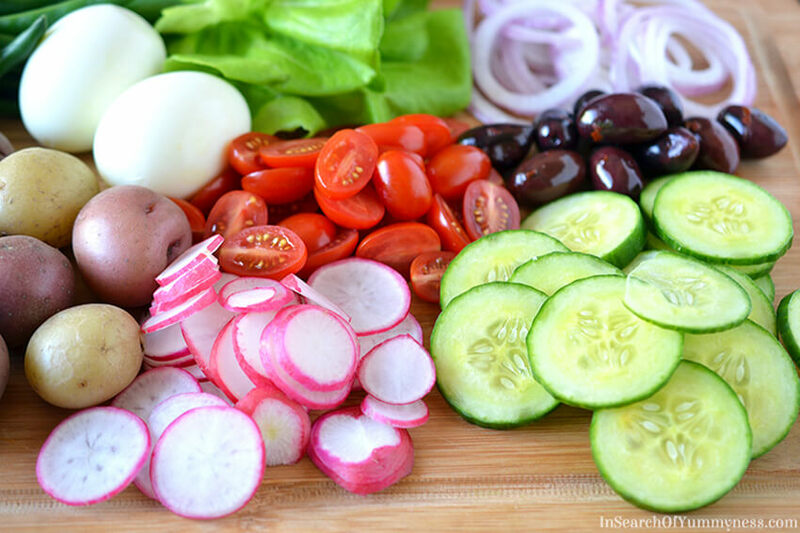 Arrange the cracked potatoes on top of the lettuce, along with the eggs, prepared vegetables and olives. Spoon the tuna out of the cans to avoid adding excess oil to the salad. You can either add the tuna directly to the platter, or place in a small bowl next to it. Season the salad with a pinch of salt and freshly ground black pepper, if desired. Serve immediately with the dressing. Tip: The leftover dressing is pretty great on potato salad too! I’m not even going to click on David’s post because I adore baby potatoes in my nicoise and IMHO, your version looks perfect. Thanks for the reminder to make this salad. I love a non-traditional Salade Niçoise. If a recipe like this can’t be a jumping off point for whatever looks best in the market, what’s the point, right? I’d love the potatoes best in this, too.